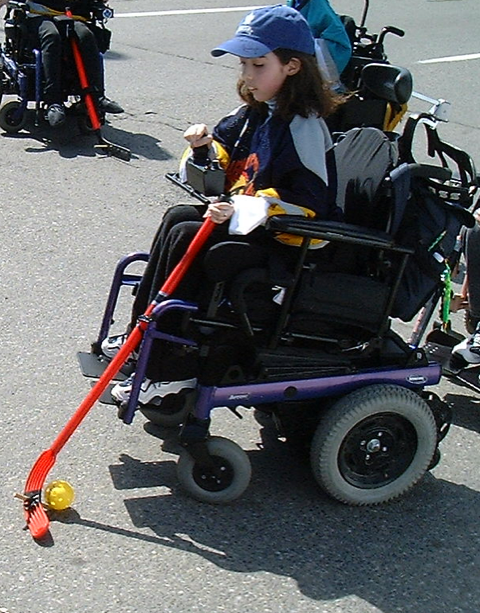 When I was 9 I was at a doctor’s appointment at Bloorview Kids Rehab in Toronto (one of the Toronto rehab centres) when a boy and his mother approached me and asked if I had ever tried playing PowerHockey. They invited me to one of their games the following weekend. As soon as I tried playing I fell in love with the sport and have been playing ever since! Playing Powerchair Hockey gives me the opportunity to play a highly competitive sport that I love while meeting new people from different countries and backgrounds. I love how this sport allows people of all abilities who use power wheelchairs to participate and each player, whether you are ranked a level 4 or 1 are an integral part of the game and team’s success. Participating in this sport has given me the opportunity to meet some of my closest friends; both in Toronto where I live but also across North America when we travel to tournaments. I even met my boyfriend playing this sport! I’ve been told that I contribute to my Powerchair Hockey team in a few key ways. One is I tend to be strategic in how I play – I am able to watch and anticipate where the play is going next. This has helped me build my defensive skills which I was honoured to be recognized as Best Defenseman at three North American Championships. I have also been able to develop leadership skills which I have leveraged in my roles of Assistant Captain and Captain for various teams. My friend was watching a game at the 2017 Canadian Championships – it was a tight and very intense game. During a quiet moment, Ramin Raunak, one of my fellow players on Team Canada, came up behind her and surprised her. I swear you could hear her scream across the livestream! This just shows how intense and wrapped up both players and spectators get in watching this intense sport! My service dog isn’t that interested though. He comes to my games and either he is snoring during the games or cries when he can’t see me – always a gamble! My biggest Powerchair Hockey dream would be to see it recognized as a Paralympic Sport. Something unique about Powerchair Hockey is that players of all abilities who use power wheelchairs can participate and be valued members of the team. This differentiates it from many other Paralympic sports as many require significant upper body strength and therefore excludes a large portion of the disabled population. 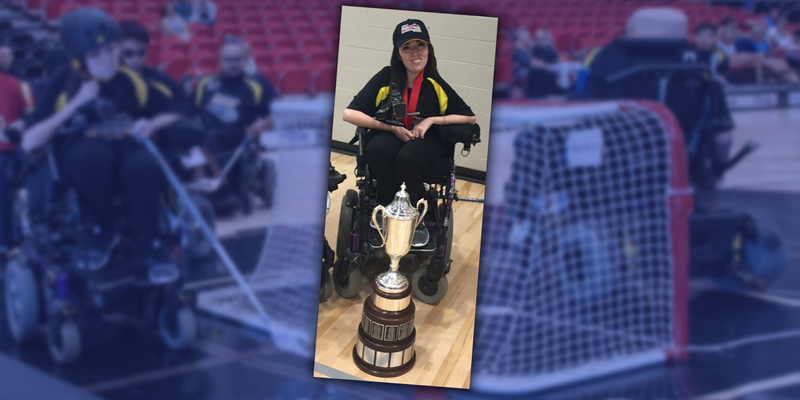 While we have competed at several Canadian and North American tournaments, this is the first time our team will be competing in the World Championships and playing by the Powerchair Hockey rules. Our players typically play by the North American PowerHockey rules which have some significant differences. As such my main goal is for us to better familiarize ourselves with Powerchair Hockey rules and become adept at this spot, gain experience at the international level and build relationships so we can continue to grow our sport. I am also really looking forward to meeting all the players and delegates from other teams, and of course eating lots of amazing Italian food! No Replies to "INTERVIEW | MEGHAN HINES"